Many weeks ago an artist ( Betty ) from Carver Massachusetts contacted me wonder if she could use one of my photos for detail to paint a raptor that she was doing. After a few e-mails a deal was struck...the deal was that she would do a graphite drawing of a photo of my choosing. If that would happen she would then redo the drawing. 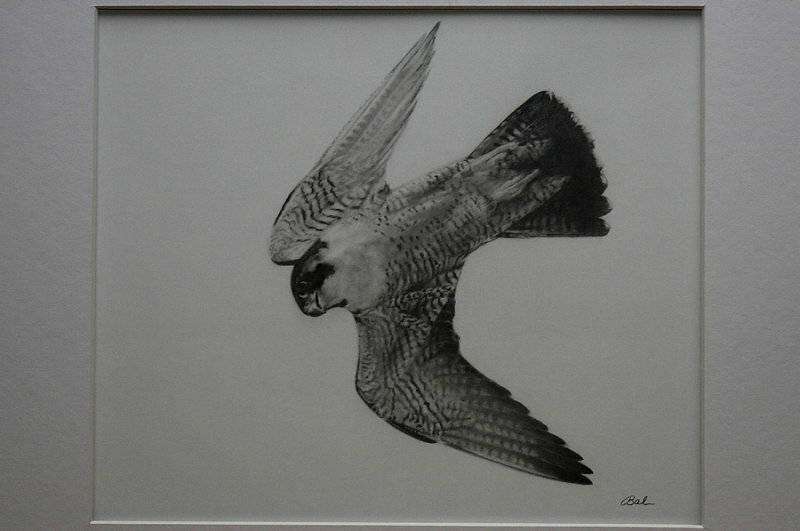 The drawing didn't sell and I just have received my 1/1 original drawing of a Peregrine in Flight. few of us can be. near. I had always felt I had a connection with them, I could ~read~ them. capture their spirits on canvas. © Photos by Dennis. All rights reserved. Unauthorized use prohibited.